Nerd Block is a subscription mystery box that delivers geeky collectibles right to your door each month. You can choose whatever theme box you are into–there’s the Classic Block, Arcade Block, Sci-Fi Block, Horror Block, Comic Block, and even a Boys Jr. and Girls Jr. Block for younger kids. The sets always includes a t-shirt, along with 4-6 other collectibles that are often exclusive to Nerd Block subscribers. I, of course, chose the Horror Block to try out for a six-month subscription to see what kind of goodies they had to offer. 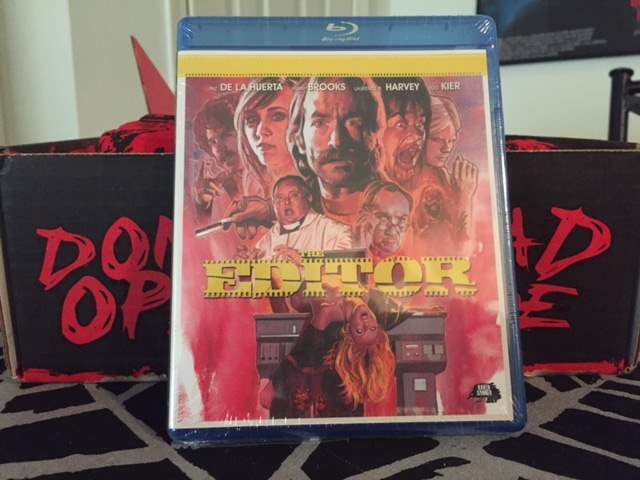 Today we are unboxing the April 2016 Horror Block. Considering that last month’s block contained almost nothing but exclusive items, this month’s more movie-specific offerings were greatly appreciated. But, there were still some exclusive knickknacks from Horror Block that were pretty neat. 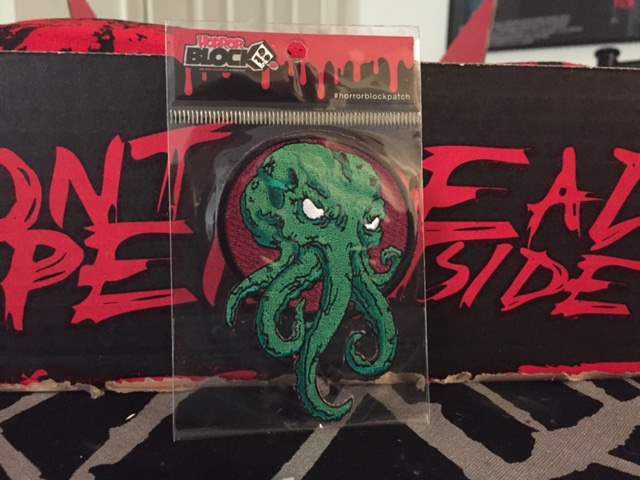 First, we have this 2-inch green Cthulu patch. I’m not much into Cthulu myself, but it is still a cute little item that would make great decoration for a jacket or backpack. I always like how Horror Block includes items that are useful, and ones that only horror fans would want to have in their house all the time, not just at Halloween. 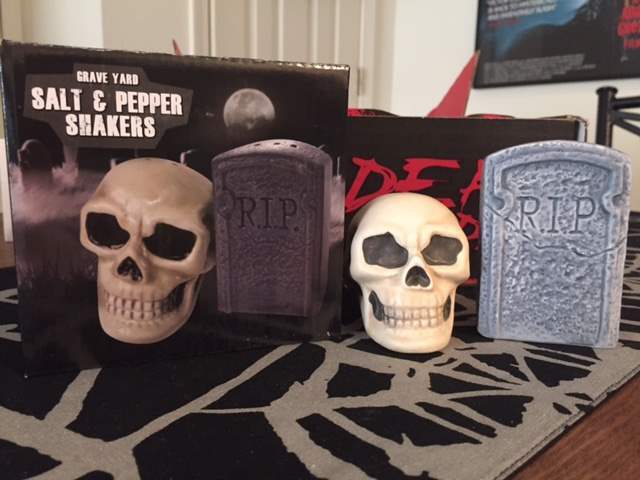 One such item is this other exclusive–a set of salt and pepper shakers in the shape of a skull and headstone. The skull is about 2 inches tall and the headstone is about 3 inches tall, and both are of good quality, but lightweight. I actually already have a set of skull salt and pepper shakers, but I may just have to switch those out for these! Pop! Vinyl Figures are incredibly popular right now, of course, so I was expecting to get a lot of them in these blocks. This is only the second one I’ve gotten, though, and it was like the folks at Horror Block read my mind and gave me one of the figures I wanted most! 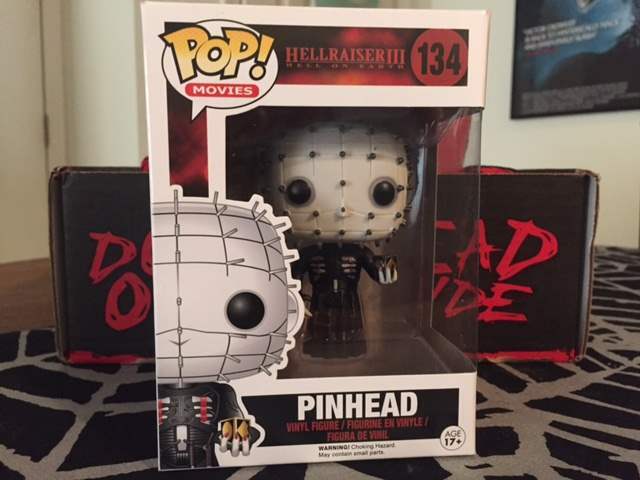 The first figure I got was of Spike from Buffy the Vampire Slayer in my Welcome Block, and now I got this adorable Pinhead figure from Hellraiser III: Hell on Earth (although there is nothing about it, to me, that says that it is from that particular film). He goes great with the Pinhead bobblehead that I already have. One thing that I was incredibly excited about seeing in my block was an actual movie! I didn’t know if that was a regular item in the blocks or not when I first signed up, and this is the first one I have received since starting my subscription. I certainly hope it isn’t the last! I still haven’t seen 2014’s The Editor yet, so I’m very happy that I’ll get to experience it for the first time in Hi-Def. Also, thumbs up to Horror Block for giving its subscribers a Blu-Ray instead of a DVD. Next up in the block is the always-present issue of Rue Morgue, which recently won a Rondo Award for Best Magazine. 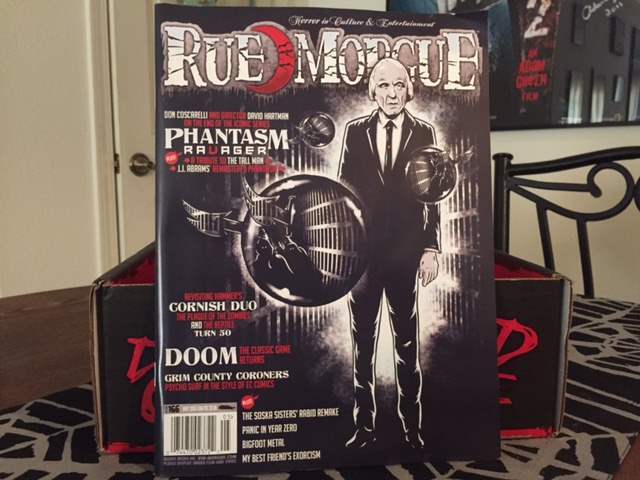 This May 2016 issue, #166, features the Tall Man on its cover and within its pages is an article honoring the late Angus Scrimm that includes memories from other Phantasm cast members. There is also a quick interview with the Soska Sisters about their upcoming remake of Rabid; a look at the Doom video game reboot; and an interesting article about two “unconventional” Hammer horror films, The Reptile and The Plague of the Zombies. The last item is the monthly t-shirt, which I always love to see, but which is also making my t-shirt collection even more out of control than it already was! 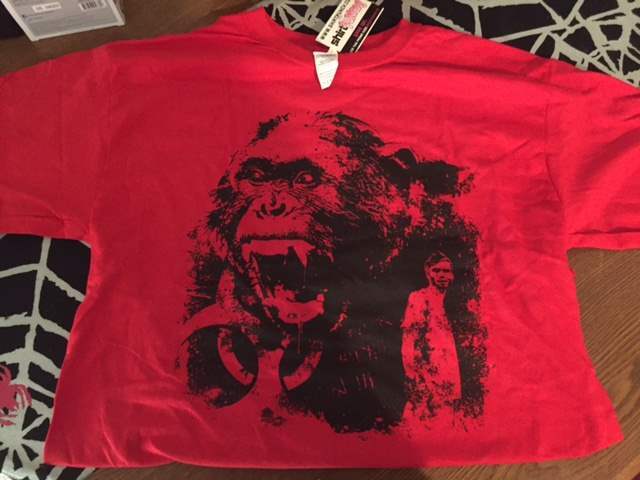 When I first looked at this shirt, I thought it was for King Kong or something, until I noticed the number hash marks and the image of Cillian Murphy from 28 Days Later. This is a really great, unique take on a design for this film, and as a fan, I am very happy to own it. I absolutely loved the April 2016 edition of Horror Block. It seems like the company is really listening to its customers and offering less of the exclusive items (and less zombie-related stuff) and more things from specific movies that many of us love. If you like what you saw here, head on over to Nerd Block to start your subscription today!